Here we are, another week and time for another Forza Horizon 3 #Forzathon event! 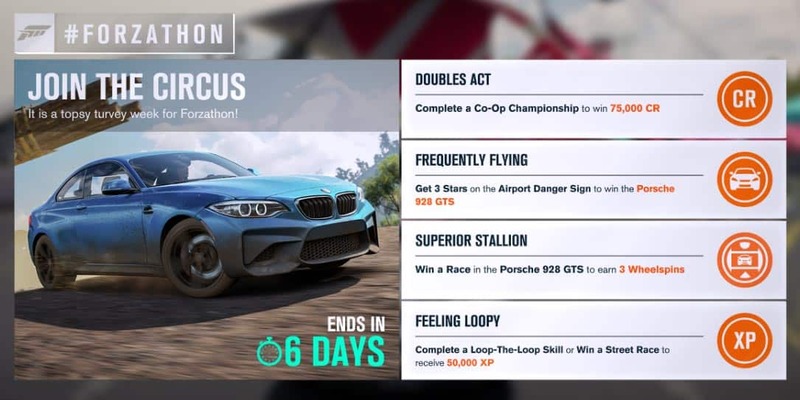 The Forza Horizon 3 #Forzathon November 30th to December 7th event gives you a chance at the Porsche 928 GTS and the usual XP, Credits, and Wheelspins. Oh, and don’t forget to check out this week’s Forza Horizon 4 #Forzathon challenges. Playground Games recentl shifted the times for their Forza Horizon 3 #Forzathons. This Forza Horizon 3 #Forzathon event started at 1:00 p.m. PT on November 30th and closes at 12:59 p.m. PT on December 7th. For the first challenge, you’ll have to buddy up and hit at least three races in a Co-op Championship to snag your weekly Credits. Next, hop into a vehicle like the 2011 Bugatti Veyron Super Sport, head to the airport, and launch your way to 3 Stars on the Airport Danger Sign. Once complete, you’ll have yourself a shiny new Porsche 928 GTS. Once you’ve earned the 928 GTS, win any race for your bonus 3 Wheelspins. Finally, head over to the Hot Wheels expansion and hit a loop for a Loop-The-Loop Skill. If you don’t have the expansion, you’ll have to win yourself a Street Race (which will take a bit longer). 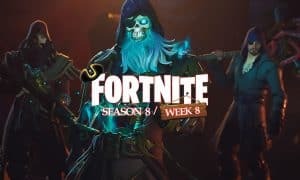 Once you’ve done either, you’ll snag 50,000 bonus XP. 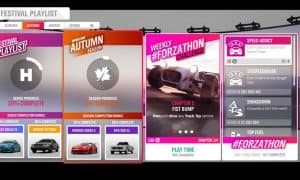 What do you think about the “Join the Circus” Forza Horizon 3 #Forzathon event? Are you going to keep completing the Forza Horizon 3 #Forzathons or are you moving on to Forza Horizon 4? Let us know in the comments below or on Google+, Twitter, or Facebook.